In a complaint filed on Friday in the U.S. District Court for the Middle District of Florida, Florida-based company PanoMap Technologies, LLC. 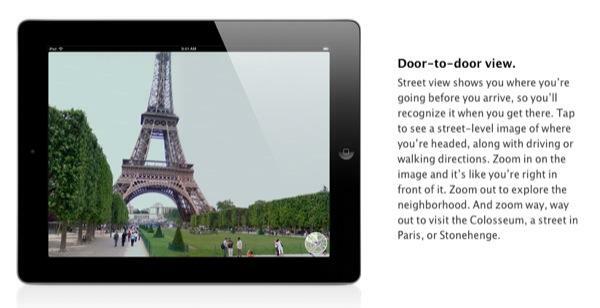 claims that Apple's use of Google Maps' Street View in the iPhone, iPad and iPod touch infringes on an existing patent that describes a similar form of image-based navigation, reports Paid Content. PanoMap is asserting U.S. Patent No. 6,563,529, titled "Interactive system for displaying detailed view and direction in panoramic images," and is seeking triple damages from the two tech giants on claims that they had knowledge of the patent before infringing upon it. Originally, the '529 patent was issued to developer Jerry Jongerius in 2003 and subsequently transferred to a shell company called Empire IP in 2011. Finally, PanoMap acquired the patent rights earlier in February. A method and system for indicating the camera position, direction, and field of view in a map or panoramic image comprises a map image window which displays a map or panoramic image of the site to be studied (house, apartment, city, etc.). A detailed view window displays a portion of the map image, taken from a point in the site. A highlighted sector in the map image represents the viewing position, direction, and field of view that the detailed view window displays. When the user changes the field of view in the detailed view window, the highlighted sector in the map image changes in synchronism. The resulting interactive windows allow a person to easily and quickly view and understand the field of view, position, and direction of the image being displayed in the detail view window. PanoMap, which has no address and looks to be merely a patent holdings firm, alleges that Google included the '529 patent as prior art when it applied for two Street View patents, one in 2008 and another in 2009. Going further, PanoMap claims that Apple visited Jongerius' website Duckware.com on July 8, 2007. The site advertises and licenses a panoramic image viewing application "PMVR" which supposedly shows "embodiments of the inventions claimed by the '529 patent." Apple's iPhone, iPad and iPod touch all come pre-loaded with a Maps app that is powered by Google Maps and thus has Street View as part of its feature set. Devices running Google's own Android platform offer identical functionality, however they are not mentioned in the suit. In the iOS implementation that was first introduced to the platform in 2008, Street View allows users to zoom in from the traditional overhead map view and navigate by moving through a series of photographs of a given location. The system was first introduced by Google in 2007 with support for a select number cities, and has since expanded to include many major metropolitan areas around the world. To create Street View, Google used cars special panoramic cameras and geo-location gear to gather imagery that was later stored and synced with GPS mapping data. Interestingly, the PanoMap name is tied a laser scanning trademark belonging to Atlanta company Construction System Associates. A representative from CSA said that the company is not involved in the lawsuit against Google and Apple.